I grew up in Pittsburgh in a neighborhood that had a big Italian population. Towards the end of the week, you’d literally start to smell garlic in the air or catch a whiff of sausage or meatballs on the wind the moment you left the house. There was no stopping the weekly Italian Sunday night dinner and you could bet that all your favorites would make an appearance including baked ziti, hot Italian sausage, Sunday sauce, and much more. Some family traditions are just too precious to leave behind, even when you start leading a healthier lifestyle — but it doesn’t mean you have to give them up, just make some minor changes to your favorite recipes so they are both tasty and healthy. People love my tomato sauce and I’m not shy about sharing “the secret ingredient” that I learned from my Aunt Mary Ann: I add a pork chop! Adding a piece of meat on the bone to your sauce is an old home-cooking secret that adds an additional level of rich flavor. So using a lean pork chop (instead of fatty sausage) lends savoriness without a lot of extra calories. Warm a large stockpot over medium heat. Add one tablespoon of the olive oil. Sprinkle the pork chop with the salt and add it to the stockpot. Cook 2 to 3 minutes, turning once until the pork is brown on both sides. Push the pork chop to one side of the pot and add the remaining olive oil along with the garlic. Cook another minute until the garlic is fragrant, then add the chili flakes if using. Add the tomato paste and stir well, incorporating the garlic. Cook for about 1 minute until the tomato paste becomes fragrant. Add the diced tomatoes, white wine, and basil sprig. Add 2 cups of water, then bring to a boil over high heat. 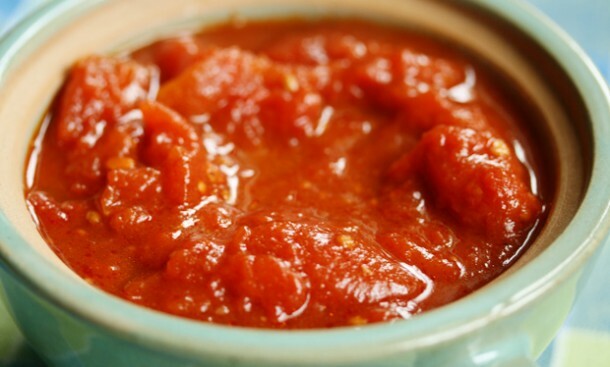 As soon as the sauce boils, reduce to a simmer and cook 3 1/2 to 4 hours, checking periodically on the level of the sauce (add 1/4 cup of additional water if the sauce looks too dry). Before serving, remove the pork chop and shred the meat (serve mixed in with the sauce or serve on the side). 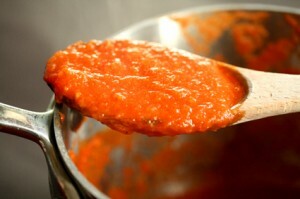 To make your sauce more kid-friendly, remove the chop and puree the sauce. In New Jersey where I live now, Sunday sauce is actually called “gravy”, and not everyone (including myself at times) has always time to do it the old-fashioned way. 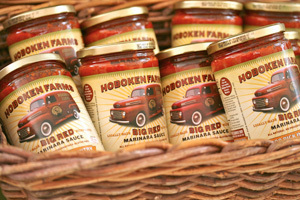 So when I want that same taste, without all the work, I go for my all-time favorite jarred sauce, Hoboken Farms Big Red Marinara. Gluten-free and preservative-free, this delectable marinara is a pantry must for anyone who wants to whip up a chicken parm or meatballs without the long wait. Simmer it, toss it over some pasta or top your favorite cooked veggie and add cheese. You can have an instant Sunday feast when you don’t have time to start from scratch. Splurge: Diehard Italians wouldn’t dream of cutting out their semolina “white” pastas. So for that reason, I’m featuring the most delicious pasta I’ve ever cooked and eaten. For the healthiest way to enjoy pasta on a regular basis, stick to whole grain, but if you want to splurge once in a while, here’s the Ferrari of pastas: Michele Portoghese is handmade in Florence in a family-run factory that I had the privilege of visiting a few years ago. The family uses special metal dies — treasured family heirlooms — to press out the shapes from an extruder. Unlike commercial brands that tend to break apart easily after cooking, this pasta has real body, because they use a high gluten grain that is harvested from local wheat, grown in a special location to ensure texture. They also happen to make some of the most delectable chocolate biscotti studded with almonds, made fresh on a daily basis. Father and sons are there on site to oversee the operations, for prefect execution and quality control. You’ll be able to taste the family pride in every bite. Whole Wheat: Let’s be honest, most of the whole wheat pastas on the market don’t taste great, both the texture and flavor shout “cardboard”! But this whole grain pasta made from farro, a grain in the wheat family, has a delightful chewy taste and mild flavor. Rustichella’s Farro pastas are made from 100% farro flour (farro is an unhybridized form of wheat that closely resembles spelt, but has remarkable body and retains its bite and texture even after reheating). This pasta is on the pricey side, but the taste and high quality are worth it! This brown rice pasta — my fave of all the g-free pastas — is made by Tinkyada and has a good chewy texture (comparable to white pastas) that doesn’t become mushy when cooked. 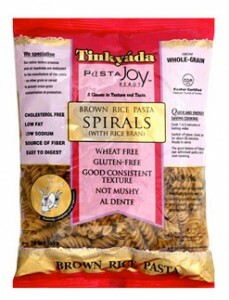 It’s also my #1 pick for kids since the color and texture is so close to standard wheat or semolina pastas. Ancient Harvest quinoa pasta is also a great option — it’s made from a highly nutritious grain. Cooking tip: Cook 1 minute less than the package instructions indicate to prevent sogginess. 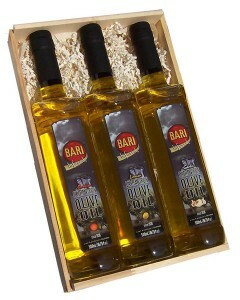 Bari Olive Oil company, produced and packed in California from locally grown olives, has a wide variety of delicious tasting olive oil and balsamic vinegars. They are known for their buttery flavored oil produced from late harvest Mission olives. Starting with a more mild tasting oil allows the flavors of other foods to come through, and I’ve used their oil in a variety of Italian and international recipes. I especially love their flavor infused oils, which allow you to add heat from chilies, basil goodness to your salads, or lemony flavor to your favorite chicken dish. Their line of uniquely flavored balsamic vinegars will take your same old dressing or marinade to a new level. My two favorites are their black berry vanilla that’s gorgeous on a beet and goat cheese salad and their orange balsamic that’s tasty on just about anything. Try it with my orange balsamic salmon. If you are looking to add a lot more nutrition to your Italian Sunday night meals, get your greens on the table. Make it simple with sauteed spinach, garlicky kale, or a tossed green salad made with red and green romaine. Or try this simple kale salad. Balsamic vinegar is a great way to cut the bitter taste of greens along with freshly grated Parmesan, Pecorino Romano, or shaved Ricotta Salata. Golden raisins, dried currants, pine nuts, orange and lemon zest, or toasted almonds are great Italian flavorings that you can sprinkle onto your raw or fresh greens. If you’ve got a busy weekend full of family outings and errands, make a gluten-free lasagna, low-carb lasagna, spicy sausage and spinach lasagna or eggplant manicotti — ahead of time. Warm them up in a preheated 350F oven and serve with your favorite greens for a complete meal.